Want to Enjoy Meals Again? Dental Treatment Can Help! 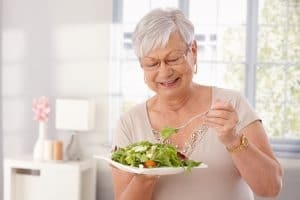 When was the last time you were able to sit down for supper, with your family or friends, and actually enjoy the meal without worry about dental pain or a denture? For patients struggling with dental problems, chewing can be uncomfortable or even painful. Unfortunately, this can also be the case for patients with ill-fitting or unsecured dental prosthetics. In either case, the great news is that restorative dental treatment could likely help to restore your smile. That way you can do more than just show up for dinner. You can actually enjoy it, with comfort as well as confidence! Are You Suffering from a Cavity Or Other Problem? Cavities are one of the most common dental problems, for both kids and adults. That also makes them one of the most common causes of dental discomfort or pain. If you are experiencing heightened sensitivity or outright pain when chewing, it could likely be due to acidic erosion. In any case, though, you shouldn’t ignore discomfort, as it is generally a warning sign of an oral health threat, whether it be a cavity or another problem. Prompt restorative treatment can help stop the pain while also helping to prevent worsening issues such as infections. In the case of most cavities, restoration involves placing a minimally invasive dental filling. For chips, cracks and other problems, a dental crown might be recommended. Do You Need a Secure Prostheses? For patients struggling to eat because of an incomplete smile or an ill-fitting denture, the dentist might recommend a dental bridge or a dental implant, which help to provide more stability than unsupported dentures. To determine which is right for you, a prosthetic consultation is best. Ready To Have Your Smile Restored? Do you need help addressing a dental problem? If so, you can schedule your restorative consultation with Gateway Dental Group in Des Moines, IA, today at (515) 244-9565.